Thanks to my brother and a recent bout of Mobile Suit Gundam: Battle Operation on the Playstation Network, I discovered Bandai’s HCM Pro (High Complete Model Progressive) line for the Gundam metaverse. These 1/200-scale models immediately suggested application to tabletop war gaming. 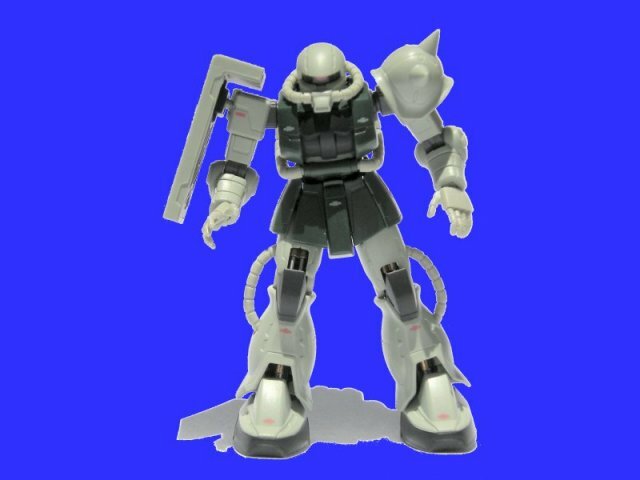 Finding also that I had a local outlet in ROBOT4LESS, I picked up a few tiny mobile suits to inspect, starting with the MS-06F Zaku II, the mainstay of the Principality of Zeon. For a “toy,” the model is fantastically detailed and fairly well articulated. Indeed, though not my favorite variation of the venerable Zaku II, this interpretation looks better and more realistic than the version that appeared in the original production animation. The model is fully painted but lacks the finishing touches that make a miniature stand out, so I thought that I could provide these with a minimal amount of effort.